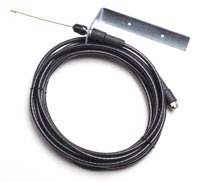 To be used in conjunction with the DC5135 Open/Close/Stop Commercial Receiver. This is a 16 foot length of coaxial cable with Type F fittings at both ends. The mounting bracket is 5-1/4" long, with a 2-1/2" outward extension. To be used in conjunction with the light-commercial receiver. This is a 16 foot length of coaxial cable, with Type F fittings at both ends. The mounting bracket is 5-1/4" long, with a 2-1/2" outward extension.